The Government required all Health & Wellbeing Boards to produce an assessment of pharmaceutical services in their areas by 1 April 2015 and at least every three years thereafter. 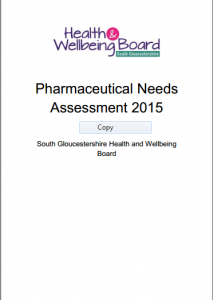 Further to the publication of the Pharmaceutical Needs Assessment, and the process for receiving and acting upon changes in the provision of pharmaceutical services which was agreed by the Health and Well-being Board, below is an update regarding the South Glos pharmaceutical list and related matters. Some pharmaceutical services may be provided by dispensing GP practices, or dispensing appliance contractors.